of M-theory w e re pr op osed [30-34] . based on the semi-light-cone supermembrane action. 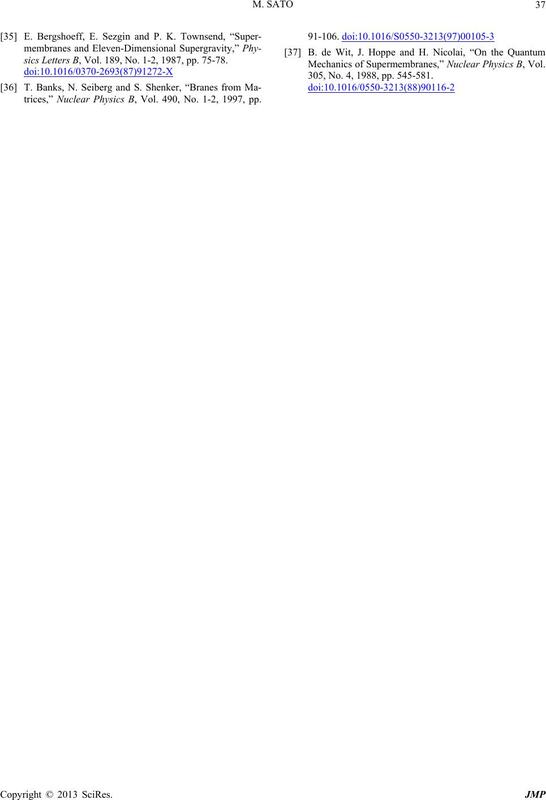 In , it is shown under an approximation up to the quadratic order in . spaces. Summation is defined naturally as linear spaces. 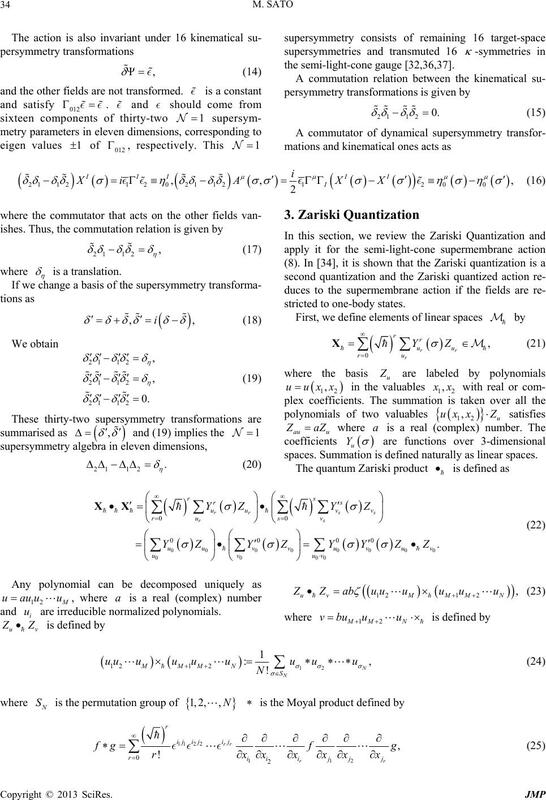 and are irreducible normalized polynomials. 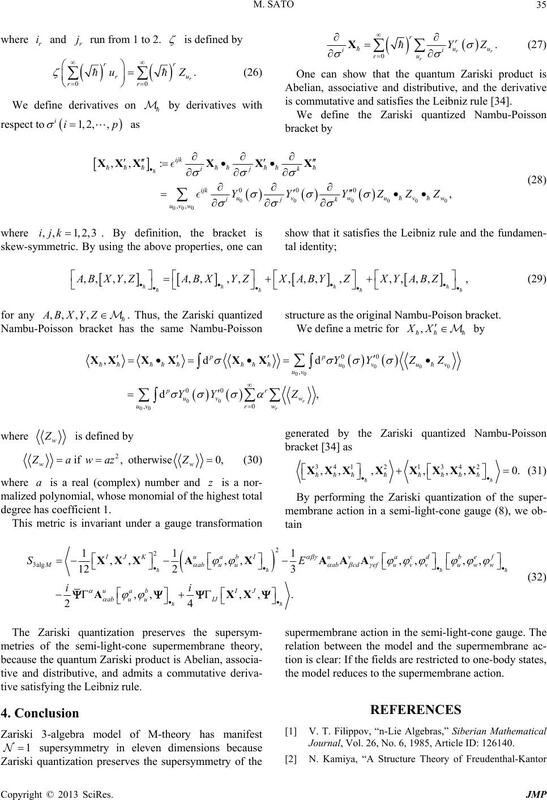 where and run from 1 to 2.
is commutative and satisfies the Leibniz rule . Nambu-Poisson bracket has the same Nambu-Poisson structure as the original Nambu-Poison brac k et. tive satisfying the Leibniz rule. the model reduces to the supermembrane action. Journal, Vol. 26, No. 6, 1985, Article ID: 126140. Algebra, Vol. 30, No. 8, 2002, pp. 3825-3850. Branes,” Nuclear Physics B, Vol. 811, No. 1-2, 2009, pp. Vol. 77, No. 6, 2008, Article ID: 065008. High Energy Physics, Vol. 5, 2008, p. 85.
ergy Physics, Vol. 6, 2008, pp. 75. S. Benvenuti, D. Rodriguez-Gomez, E. Tonni and H.
ited,” Journal of High Energy Physics, Vol. 7, 2008, p. 3. Energy Physics, Vol. 10, 2008, p. 91. Chern-Simons Gauge Theories,” Physical Review D, Vol. 79, No. 2, 2009, Article ID: 025002.
cal Review D, Vol. 7, No. 8, 1973, pp. 2405-2412. Physics, Vol. 2, 2001, p. 13.
ometry and Physics, Vol. 49, No. 3-4, 2004, pp. 294-331. High Energy Physics, Vol. 6, 2008, p. 53.
view D, Vol. 78, No. 2, 2008, Article ID: 025027.
ics, Vol. 9, 2008, p. 2. 6 Superconformal Theories of ABJM Type,” 2010. 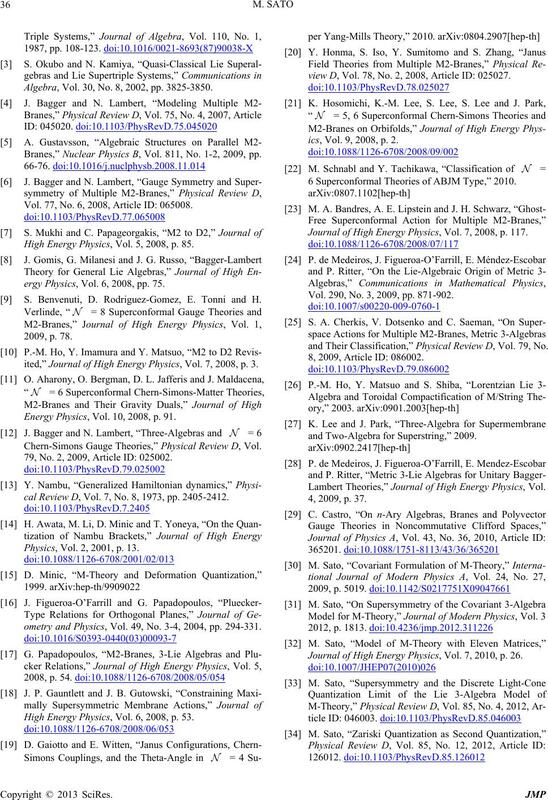 Journal of High Energy Physics, Vol. 7, 2008, p. 117. Vol. 290, No. 3, 2009, pp. 871-902.
and Their Classification,” Physical Review D, Vol. 79, No. 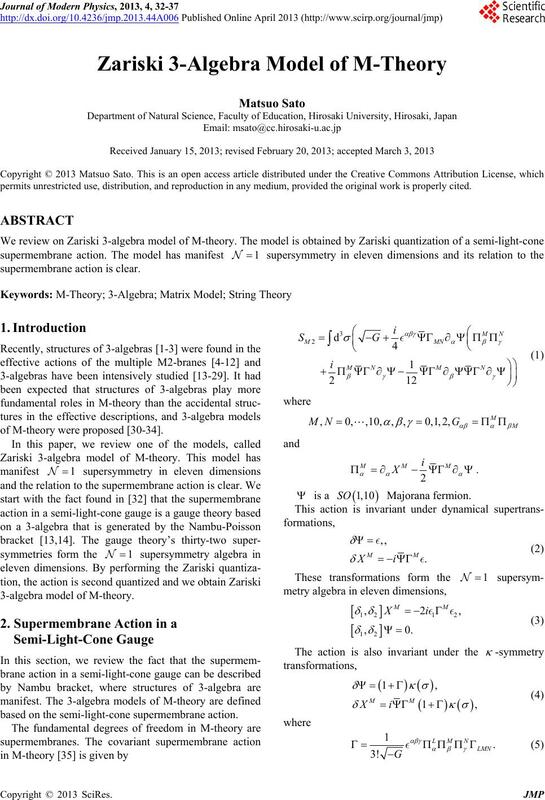 8, 2009, Article ID: 086002.
and Two-Algebra for Superstring,” 2009. Lambert Theori es,” Journal of High Energy Physics, Vol. 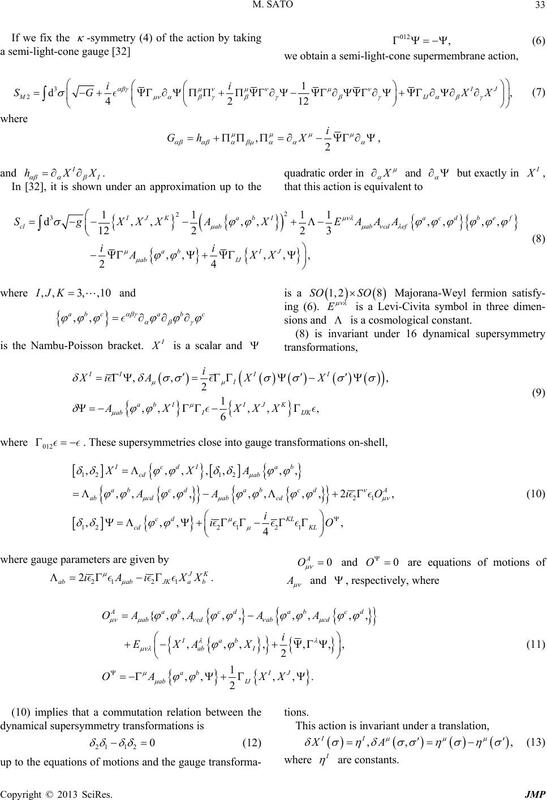 Journal of High Energy Physics, Vol. 7, 2010, p. 26.
sics Letters B, Vol. 189, No. 1-2, 1987, pp. 75-78.
trices,” Nuclear Physics B, Vol. 490, No. 1-2, 1997, pp. Mechanics of Supermembranes,” Nuclear Physics B, Vol. 305, No. 4, 1988, pp. 545-581.